A wealth of exciting Sherlockian treasures lay hidden in old, inaccessible newspapers; untouched for over a hundred years. These ephemeral, late 19th century papers covered the writings of Arthur Conan Doyle and the doings of Sherlock Holmes as they first appeared to the world. It was the spring of 1894. Sherlock Holes was dead. Conan Doyle was away in Davos, and not much new was published by him. Yet it was one of the most important phases in his writing career. In the aftermath of the Reichenbach Falls tragedy, it became evident what members of the press actually thought about Conan Doyle’s creation. Some explained why they loved him so much, while numerous critics celebrated the death of the detective. Now that Holmes was dead, Conan Doyle could be reinstated as one of the most important British authors of fiction. When the famous writer finally returned to England, there was no doubt what occupied his mind. It quickly became the theme of his actions – and of this very volume: The friendship between the two great nations of the English speaking race, the United States of America and the United Kingdom. 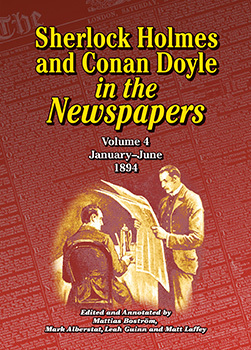 The Sherlock Holmes and Conan Doyle in the Newspapers series offers a unique perspective on the literary career and public life of Arthur Conan Doyle. It also reflects a universally celebrated Sherlock Holmes — no longer an obscure detective — who has been transformed into a literary icon and cultural institution with a life of his very own.